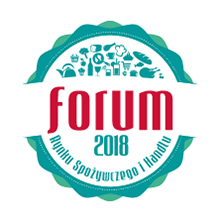 CEOs and directors of food companies and retail chains, market experts and analysts, marketing celebrities, important decision-makers and professionals – approximately one thousand people are expected to take part in the 11th edition of the Food Market and Retail Forum in Warsaw this year. "The forum is an excellent opportunity to bring together representatives of industry organizations, major companies, food producers, processors, distributors and traders, as well as people with a real impact on changes in the sector. Year by year, the meeting produces constructive conclusions and insights into the state and prospects of one of the largest branches of the Polish economy. Ample attention is also devoted to factors that completely redefine the industry today: new technologies, start-ups, healthy food and lifestyle trends, as well as the growing links between traditional brands and local communities", says Edyta Kochlewska, editor-in-chief of Rynek Spożywczy [Food Market] magazine and the dlahandlu.pl website.